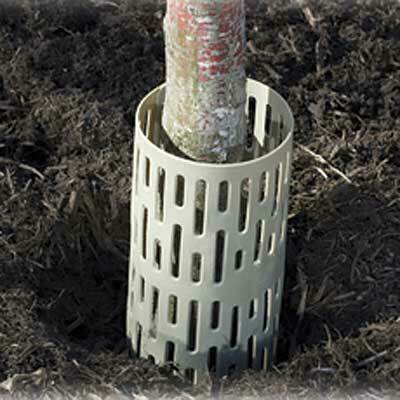 Protect the base and bark of each of your new trees by surrounding them with these Gardeneer Tree Guards. Placing a guard around the base of a sapling or newly transplanted tree helps protect it from damaging insects, rodents, or mowers. The flexible, plastic construction of each unit makes it simple to wrap around your tree, and a wealth of openings throughout the piece provide ventilation for the bark. Two tabs rest on one end of the guard, and can lock into place on one of the openings for protection around the entire trunk. Use a few guards together to surround larger trunks, for fantastic versatility. The tan color of each piece meshes with your landscaping, and is great for use season after season. Keep your trees safe from lawnmowers and trimmers with these Tree Guards. Note: This case pack includes 30 of the Gardeneer Tree Guards.